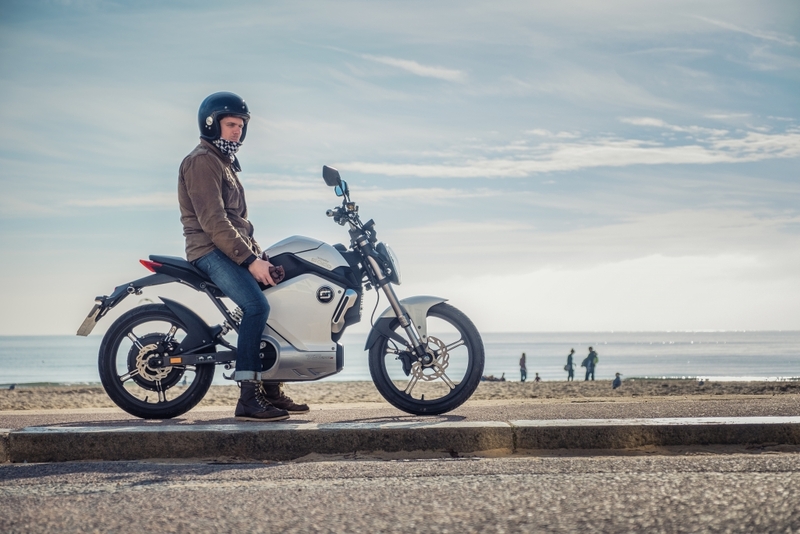 To many, the gentle whine of an electric motor will never replace the roar of a mighty V-Twin engine but like it or not, the impending march of vehicle electrification is showing now signs of abating. You can’t really blame the manufacturers either, as many of the world’s largest and busiest cities have announced plans to ban the internal combustion engine from their roads in the near future and stricter emissions and noise tests are making development of the internal combustion engine expensive, especially for motorcycle makers. It’s a bitter pill to swallow for many but spend some time with a genuinely good electric vehicle and it quickly becomes clear that they are not only enormously practical, they can also be an utter hoot. 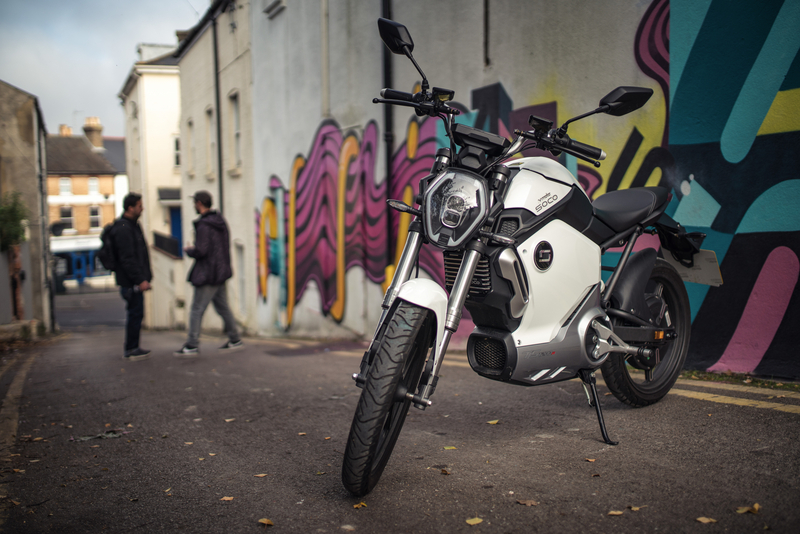 The latest Super Soco is a great example, as the small capacity scooter rival boasts some sharp looks, an all-electric range of 30 miles and the ability to charge the on-board batteries in around 7 hours from a standard plug socket. 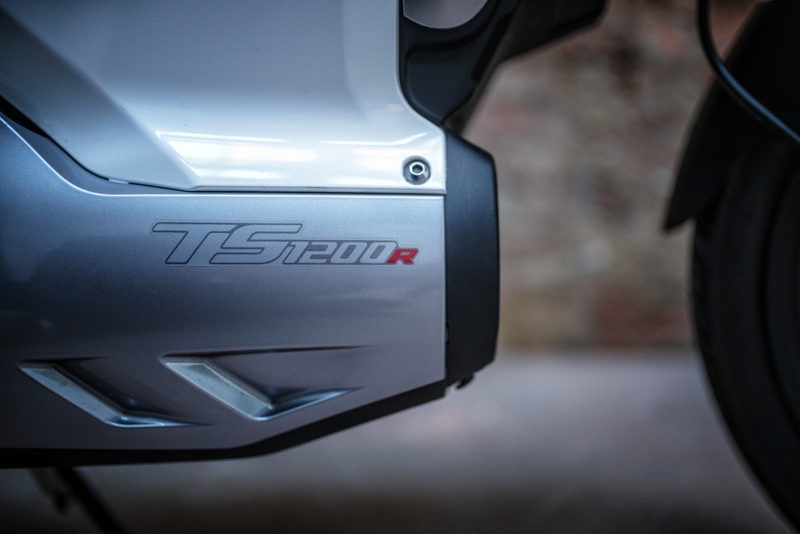 Performance is designed to match that of a typical 50cc run-around, so it struggles to get much over 30mph (in order to save juice) but with 120Nm of torque instantly available, it feels sprightly enough. Based on a fairly basic carbon steel mainframe and aluminium rear frame, the Super Soco is then lavished with plastic panels to give it a pleasingly futuristic overall aesthetic. 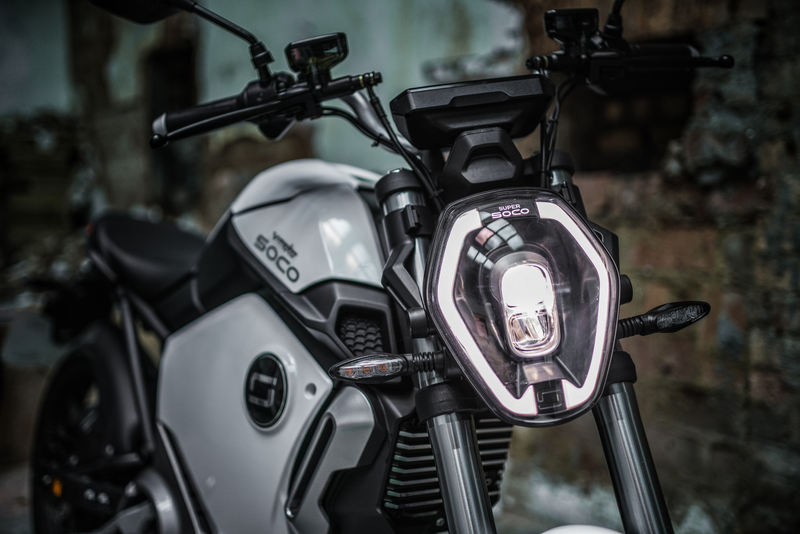 There’s a razor sharp LED headlamp at the front and neat under-seat rear light, while the upright bars and contoured seat ensures the Super Soco is super easy to jump on and ride. Better still, the foot pegs are mounted to a rotating plate, meaning it’s possible to switch their positioning with a spanner from flat (like a scrambler) to slightly set back for a slightly sportier ride. The emphasis really is on slightly, there. With a seat height of 770mm and an overall wheelbase of 1320mm, it is undeniably diminutive and anyone over six foot tall will probably look a little bit daft on it, but it’s comfortable nonetheless. There are a couple of cool touches that set it apart from the standard scooter crowd, namely the upside down forks at the front, the clear LCD display screen, the electric push start switch and the ace cooling duct at the front, which makes it look a lot sportier than it actually is. Thanks to a lack of fuel tank, the Super Soco boasts a pretty cavernous storage area at the front. The battery pack is stashed in here, but there’s plenty of room for the charger and any other accoutrements you can fit around it. The rear wheel sports the 1200W Bosch electric motor (complete with built-in disc brake) and the battery pack itself can be removed entirely, which bodes well should it need replacing in the future. Unfortunately, there’s a lack of regenerative braking (probably to keep costs down) and there’s no way of plugging the machine into a socket without first lifting the tank cover*, removing a small plastic lining and plugging directly into a battery. This could prove an issue if charging in the wet,which is not advised, or if any passing drongo fancies unplugging your ride for a laugh or throwing his empty box of McNuggets into the storage area. That said, you can remove the battery entirely and it’s not exactly large, so many inner-city residents will likely take the battery pack home with them and charge it this way. 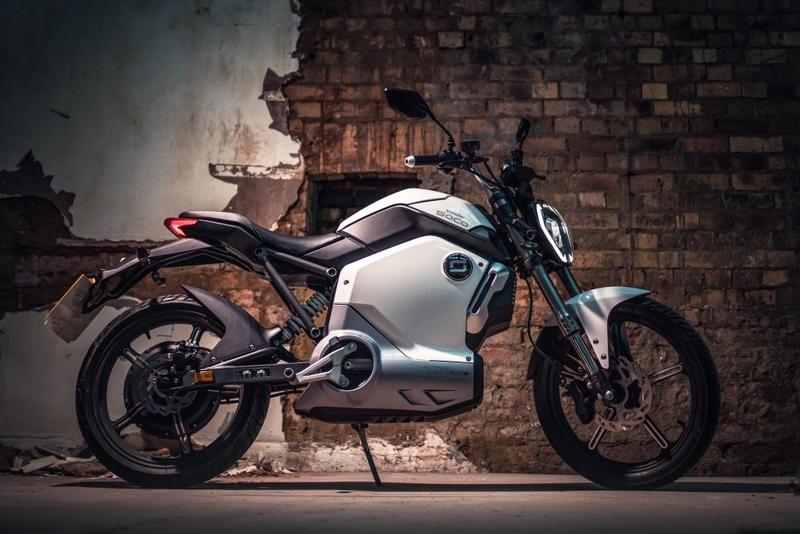 The makers of the Super Soco understand that a fancy-looking electric machine that weighs just 78kg is likely going to be a target for light-fingered fiends, so it has equipped it with an immobiliser and motion sensors. Starting the bike is as simple as hitting a button on the provided key fob and then thumbing the electric starter button. The bike erupts into life with a dazzling light display from the LCD display and a little Windows 97-esque fanfare. It’s completely cheesy but strangely cute. 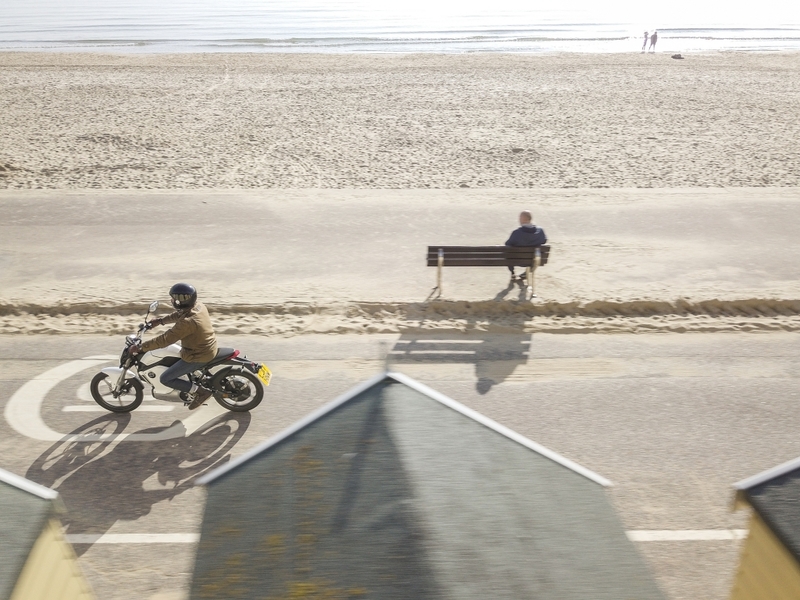 From here, it’s just a case of kicking the side stand and twisting the throttle – there is no clutch, there are no gears, no messy chain, nothing greasy to deal with, just instant power. It’s refreshingly simple. Upon first ride, we were left mildly disappointed at the distinct lack of acceleration until we quickly realised there were three driving modes to select from. The first is for eking out the batteries to the max, so the Super Soco travels at ‘granny-on-a-bicycle’ pace. Flick it into mode two and things improve slightly but we found mode three (Sport mode) to be by far the best setting. This unleashes full power from the electric motors and sees the stylish scooter rival get up to speed with minimal fuss. Unfortunately, the bike tops out at exactly 30mph, meaning there were a few cases of frustrated motorists bunching up behind us, while uphill stretches were definitely a struggle. But it simply meant we switched our routes for the winding rat runs and shortcuts through town, where the Super Soco seems to excel. 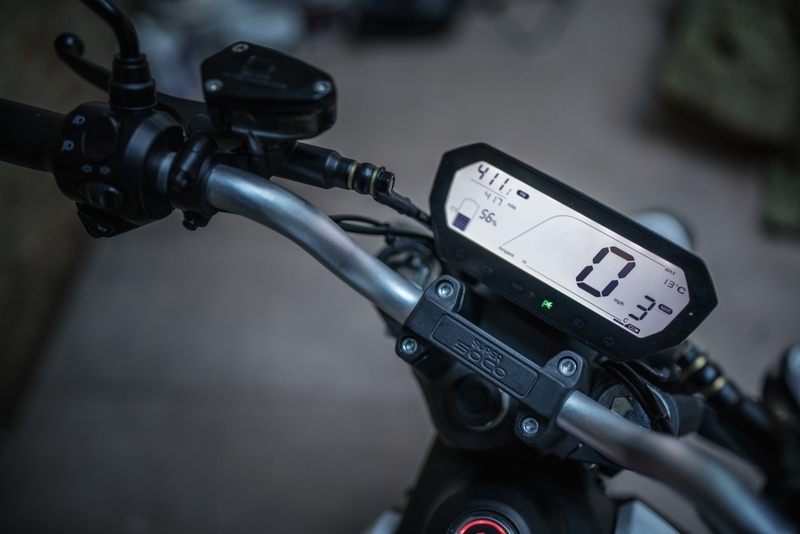 Life with an electric motorcycle couldn’t be simpler; so long as you have a place to plug in, it’s as easy as pulling up, unlocking the storage compartment and sticking it in a socket like you would a laptop or smartphone. 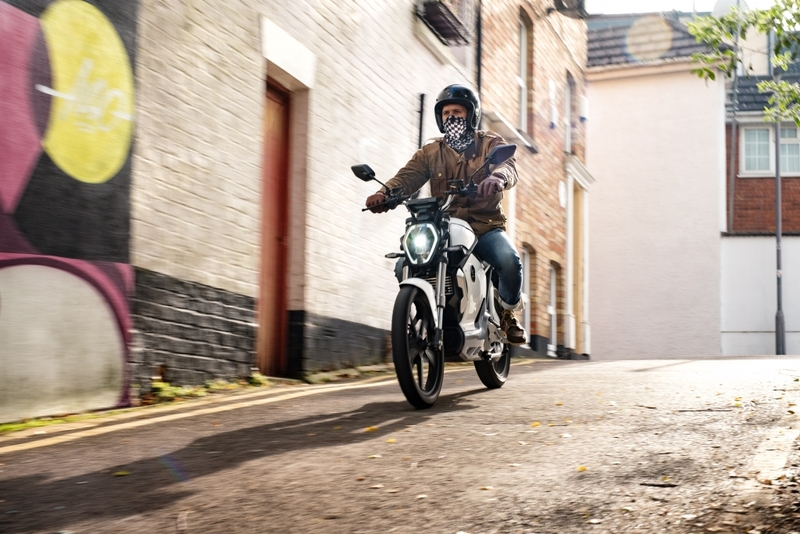 Once over the initial adjustment to life at 30mph, it actually proved a genuine giggle to thrash around town on the Super Soco. Our daily commute is only around five miles each way, so we could easily get a couple of days worth of riding out of the mean machine and it soon became a challenge to ride everywhere flat-out, including through corners. The lack of engine braking and noise makes it feel a bit like riding a glorified bicycle, but at full pace, all of the time. 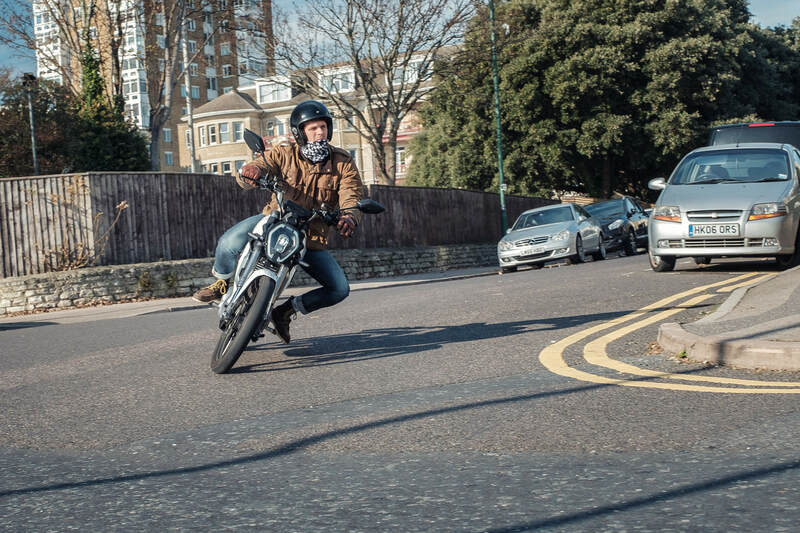 It means the Super Soco swoops through corners and brilliantly nips through snarled traffic thanks to its tiny frame. Granted, we were left wanting a bit more power on quite a few occasions but it was one of the most convenient forms of transport at our disposal. Nobody bats an eyelid if you decide to briefly wheel it along the pavement and park it up in the bike racks, while a small D-lock is enough to secure it to most railings. Popping to the shops? Hop on the Super Soco. Quick dash back home to pick up some lunch? Jump on the Super Soco. It would make an epic Deliveroo vehicle, put it that way. 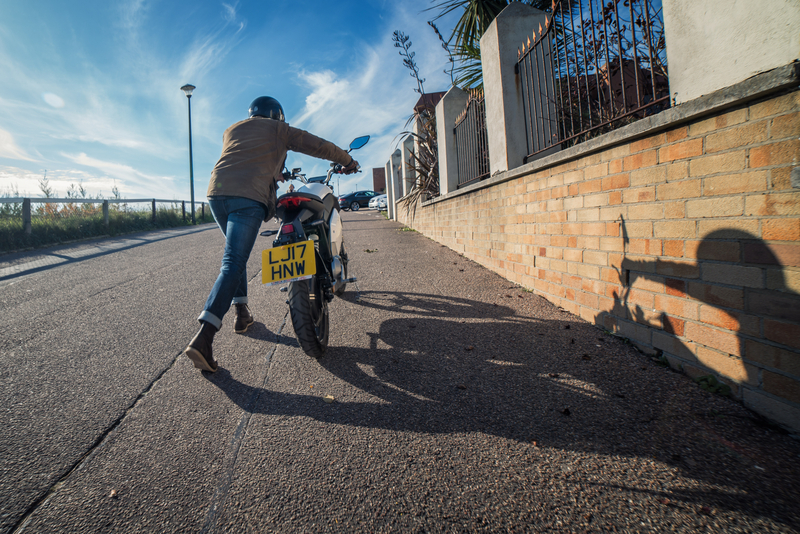 Naturally, there are a couple of things that can prove a bit of a pain about life with an electric bike. Pedestrians have a tendency to step out in front of the silent machine, fellow motorists can forget you are there and the temperature can really affect range. Also, the range read-out can be a little ponderous, with a 56 per cent battery life suddenly sapping to 4 per cent with no prior warning at one point. Although, we had the machine sat with its lights on while we photographed it and it could have simply been the system catching up with itself. We would also opt for a bike with slightly more power, so we could occasionally hit the 40mph limit roads, as well as adjust the suspension settings slightly. It could feel overly firm over some of the worst surfaces. However, the lack of oily parts means maintenance is an absolute doddle, the distinct lack of fuel station visits was a breath of fresh air (literally) and the ownership experience was as easy as they come. At £2,349, it’s arguably slightly more expensive than its petrol-powered rivals but only just. Factor in the low running costs and the fact it’s around 1p per mile after the initial outlay and it suddenly starts to make sense. 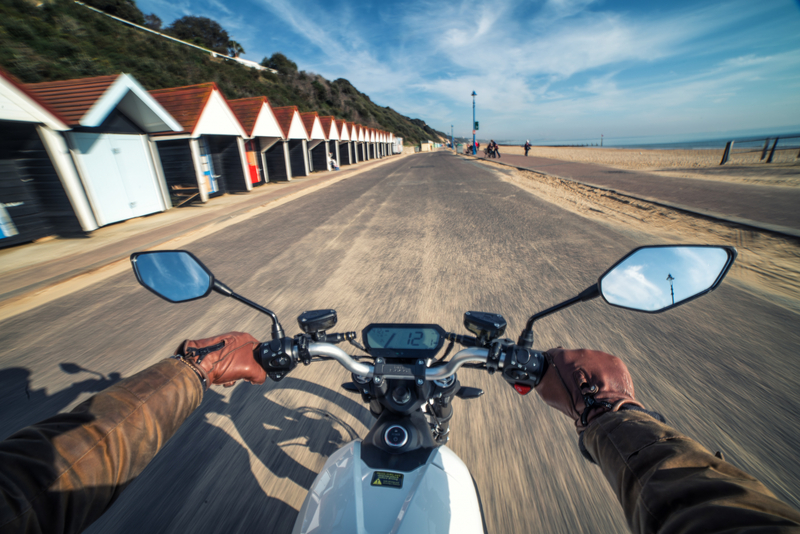 Yes, some will require a CBT to ride it legally but it is exempt from vehicle tax and only needs an MOT after three years. 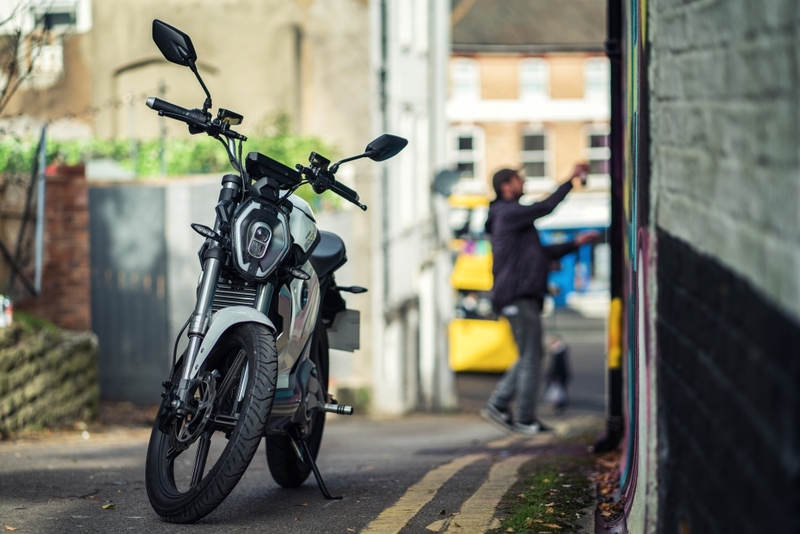 Those with short commutes or younger folk looking for freedom should definitely take a closer look at the Super Soco – it’s cheap, easy going, looks smart and feels perfectly at home in the city. And that’s not something its internal combustion counterparts will be able to say for much longer. *Update: We eventually located a small charging socket on the frame of the bike after being pointed in the right direction by someone from Super Soco. It’s hidden under a tiny rubber flap on the frame. It does make charging easier but it isn’t lockable, so hooligans can still unplug it if the so wish.